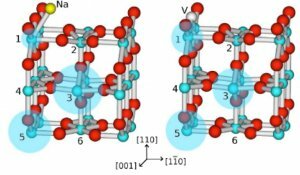 Localization of excess electrons on the surface of reduced rutile Physical chemistry of oxide surfaces is driven by surface defects. In the case of TiO2 – the archetype of reducible oxide - only the reduced TiO2-x state associated with Ti4+ → Ti3+ is active. However the Ti sites carrying the excess electronic charge (Ti 3d) are discussed : surface ? Subsurface ? Interstitial ? The spatial distributions of Ti 3d resulting from the adsorption of sodium or surface oxygen vacancies highlighted by resonant photodiffraction appear similar (collaboration with Sylvie Bourgeois (Dijon), Dominique Chandesris (SUN), Alberto Morgante (Elettra)) : this observation shows that the position of the charges, primarily sub-surface, is dictated by the electrostatic potential, in agreement with calculations of the team [Albaret et al. Phys. Rev. B 65 (2001) 035402 [link]]. Excess electrons in the TiO2(110) surface revealed by resonant photodiffraction : Left : Na adsorbed on the TiO2(110) surface, right : oxygen deficiency. P. Krüger, S. Bourgeois, B. Domenichini, H. Magnan, D. Chandesris, P. Le Fèvre, A.M. Flank, J. Jupille, L. Floreano, A. Cossaro, A. Verdini et A. Morgante, Phys. Rev. Lett. 100 (2008) 055501 [link]. P. Krüger, J. Jupille, S. Bourgeois, B. Domenichini, A. Verdini, L. Floreano et A. Morgante, Phys. Rev. Lett. 108 (2012) 126803 [link].